Rumor has it Edvard Munch was out for a walk one day and the sky turned red. As the internet wasn't around to immediately reassure him, he thought it was the end of days. Turns out there was a volcanic eruption and the red sky was the ashy aftermath. 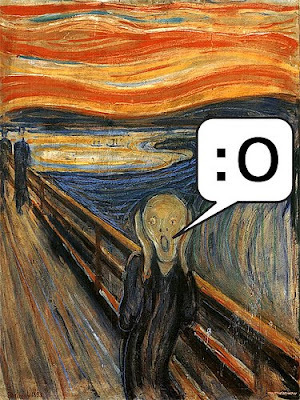 He painted The Scream to express his apocalyptic mood and now we all spoof it for fun and clear conveyance of mood. I grew up in an urban town. There were three white kids in our grade school and they were all related. Most of the school's population came from a nearby Projects (which has thankfully been torn down due to violence and drugs). So I'm extremely sorry to say that a lot of our teachers (being old school minorities themselves) tried to educate and have us believe in ourselves by blaming a lot of society's ills on The Man. It wasn't until I got to high school that I learned the term "reverse racism" and was able to see how much brainwashing had occurred in our early years. A friend linked me to Professor Griff discussing occult rituals in hip hop tonight, thinking I'd get a kick out of his ridiculous assertions and nonsensical reasoning. He talks about how the media is brainwashing children and adults into stupidity and asserts M.E.D.I.A. stands for "Multi-Ethnic Destruction in America." The media was always a huge topic in grade school and my 8th grade teacher even sent me to the school counselor because I liked heavy metal and that would obviously lead to satanism. Now I agree that today's music (especially the nonsense rap I prefer these days) lacks substance and the ability to make a listener think. At most it makes me marvel at puns and wicked wordplay. I'm glad that my younger cousins don't listen to the misogyny I can't tear myself away from. Yet I don't think there is anything wrong with all of our music starting to sound alike. I get a kick out of seeing black babies with mohawks and hearing electric guitars on a rap album. I don't believe the globalization of our interests weakens us. In some cultures knowing a person's true name was a powerful thing. Now we know everyone's names and can appreciate (or just wonder at) their cultures, foods, speech, habits and living. Perhaps the media is dumbing everything down in order to make everything accessible but I don't believe this will lead to Idiocracy. Its just a breaking down of the old norms in order to make us understand (and hopefully accept) each other. Then we can all rebuild with a better understanding and as a united people instead of isolated groups. While 100% of what that youtube guy is complete BS, I remember being an impressionable youngster sitting at my desk and listening to Mr. Howell deliver similar rants in class. The scariest part is that I saw him two years ago and he was still teaching 7th graders. It just made me want to SCREAM.